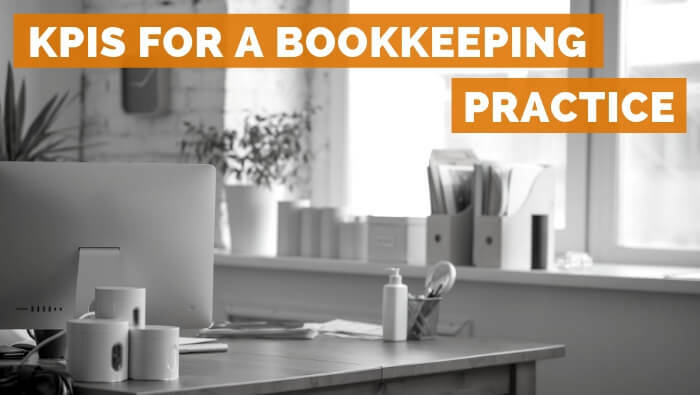 Bookkeeping practices are changing. They are very different to the way they were 5, 10 or 20 years ago and for this reason, bookkeeping practices need different KPIs (key performance indicators) to manage them and measure performance. Using the right KPIs will help you understand what is working in your practice and what needs improving. KPIs are especially important if you are growing the practice with the plan to build something valuable to fund your retirement. Traditionally, KPIs in bookkeeping practices followed the lead of accounting practices. They were focussed on the revenue earned by each employee and on employee utilisation rates (what percentage of hours were billable to clients) and write-off rates (what hours worked couldn’t be billed to clients or that clients wouldn’t pay for). With the transition from hourly rates for bookkeeping (in 6-minute intervals) to the greater prevalence of fixed-fee and value-pricing models, different KPIs are needed to measure success. However, before launching into a discussion of new ways of looking at KPIs for bookkeepers, don’t stop measuring time just yet. It’s that the measurement of time has another purpose and Diane Lucas’ recent article on Value Pricing explains that very well. The KPIs for the modern bookkeeping practice that we discuss here have been adapted from the SAAS (software as a service) world. These KPIs are ideally suited to many modern bookkeeping practices as the regular, fixed billing for clients is a similar financial model to the software subscription. Like the software business, bookkeepers have similar issues of taking time to recover marketing costs and of needing to understand the lifetime value of their clients. This KPI is simple to calculate. It’s your total revenue divided by the number of active clients. It gives you a guide to the quality of your client base. Do you have a smaller number of high-paying clients or a large number who pay a small monthly fee? You can increase this KPI without getting new customers by offering additional services to your existing clients. Do you want fries with that? A variation on this KPI is Average Gross Profit per Client. Use the same calculation but take off the direct costs (mostly wages) of servicing the clients. This can take more effort to calculate, depending on the systems you are using, but will give you a better picture of the value of each client. What does it cost you to gain a new client? For small practices, where much of the new business comes from word of mouth, this can be very low. Larger practices, who may have a full or part-time staff member dedicated to marketing, tend to have higher costs. Consider all the costs involved in finding new clients including time, advertising, branding and social media management. Divide those costs by the number of new clients each month and you’ll know what each client costs you. Having calculated the Cost of Acquisition, divide it by your Average Revenue (or GP for greater accuracy) per Client to get the Recovery Months. How many months do you need to keep each client to recover your marketing costs? Churn is a technical term that is much-loved in the subscription business and one that is important to modern bookkeeping practices too. It tells you how many customers you’ve lost each month as a percentage of your total customer base. Given that it’s generally more expensive to gain new customers than to keep existing ones, lower is generally better for this KPI. Every business, no matter how good, will always lose some customers. The trick is to keep this low and manage it well – except for the occasional unprofitable customers that you are better off losing. A variant on the standard churn rate is to calculate Revenue Churn (monthly revenue lost as a percentage of total revenue) or Gross Profit Churn. These can sometimes give a better idea of the true value of the customers lost – but they are often harder to calculate quickly. Knowing the lifetime value of your customers is important in any business. It helps you focus on the long-term relationship with them rather than short-term gains. Lifetime value is best calculated using the Average Gross Profit per Client and you can use Average Revenue if that’s all you have available. Divide the Average GP by the monthly Churn Rate and you’ll have your client’s lifetime value. For example, if your average gross profit is $100/client per month, and the churn rate is 1%, the lifetime value of each client is $10,000. Thinking of a client who is worth $10,000 to your business can give you a different perspective to when you thought of them as worth $100. It also puts your acquisition rate into perspective: Spending $1,000 on marketing to get a client who is worth $10,000 over time makes sense. Spending that $1,000 on a client who may only stay a few months doesn’t make sense. Lastly, let’s look at the total value of your customers. The maths is simple on this one if you’ve followed along so far. Simply multiply the Lifetime Value by the number of customers you have. Using our previous example, if you have 50 clients with an average lifetime value of $10,000, your customer value is $500,000. So, what does this number tell us? Essentially, it’s saying that if you took on no new customers but continued to service the existing ones (and lose them at the same rate), the total gross profit you will make is $500,000. Therefore, bookkeeping businesses with fixed or value-pricing models tend to be more valuable than time-based practices. They give an incoming owner some confidence in the projected revenue. The combination of these 5 KPIs (Average Revenue per Client, Cost of Acquisition, Churn Rate, Lifetime Value and Customer Value) will enable you to successfully monitor the growth of your modern practice. If you’re using Calxa Premier to manage your bookkeeping practice it’s a simple task to customise each of these KPIs and add them to a Report Bundle for easy delivery each month.